In the two years since DDR-2 memory was released, modules have rocketed from PC2-4200 speeds right through to PC2-8500! The industry has seen DDR-2 RAM more than double its initial operating frequency. For comparison's sake, it took almost five years for SDRAM and DDR-RAM to double in speed from its introductory modules... PC-66 and PC-1600 respectively. Up until recently the rapid succession of DDR-2 memory speed increases has been largely overshadowed by the AMD Athlon64 and low latency DDR-RAM. With the socket AM2 AMD Athlon64 processor now firmly relying upon DDR-2 RAM to fill its bandwidth needs, its rising star is assured. 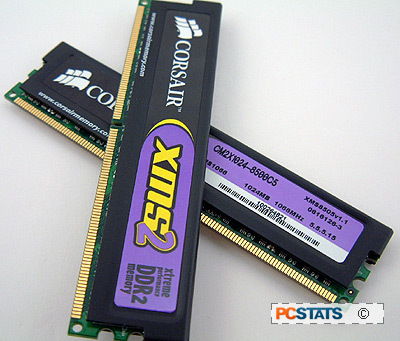 Corsair has introduced a whole slew of memory in the last month; the releases spanned the gamut from low latency DDR2-800 parts to super high speed DIMM's like the Twin2X2048-8500C5 that PCSTATS is evaluating now. Even though much of the memory has been targeted towards Socket AM2 users, these DDR-2 parts will work equally well with dual core Intel Pentium 4/D processors. The focus has certainly been on supplying appropriate memory for socket AM2 Athlon64 systems, but there is no reason why Intel users should feel left out of the party. Corsair's latest Twin2X2048-8500 memory is almost too hot to handle right out of the package.... just look at these specs - default timings are 5-5-5-15, each PC2-8500 module is 1024MB in size, and Corsair guarantees that its memory can run at a blistering 1066 MHz! Yikes! With a retail price of $510 CDN ($455 US, £246) for this 2GB PC2-8500 kit, the Corsair Twin2X2048-8500C5 memory is definitely built for the enthusiast crowd. That said, it's also among the fastest DDR-2 on the market right now. 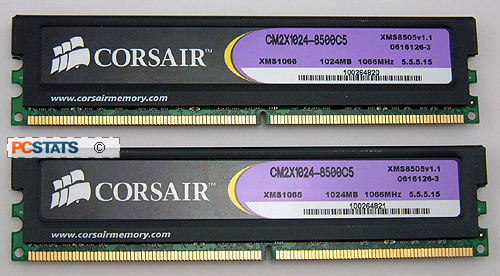 The two 1GB Corsair Twin2X2048-8500C5 DDR2 DIMMs are designed to run in a dual channel configuration. Corsair uses an overclocker's trick to reach the 1066 MHz speed - it increases the default voltage of the memory from 1.8V to 2.2V. That's quite a jump in power, so we'd recommend you ensure your case cooling is moving a good amount of air through the chassis or these modules may get a little hot. According to Corsair, the Twin2X2048-8500C5 DIMMs are hand tested and packaged together immediately following testing to ensure compatibility. Corsair has not publicly stated which platform this memory is designed for, but based on our experience it should function just fine on both socket AM2 AMD and Intel DDR-2 platforms. Corsair and nVIDIA have co-released a new memory-centric standard called Enhanced Performance Profiles (EPP), which for the moment is specific to the nVidia nForce 500 series chipset and Socket AM2 AMD Athlon64 platform. Enhanced Performance Profiles take over from where the Serial Presence Detect (SPD) EEPROM that is on every stick of memory leaves off, and adds extra information about how much faster the memory can run while remaining completely stable. The EPP information permits compatible motherboard chipsets and BIOS' to dynamically adjust memory timings and voltages for improved overall performance without any user interaction. If you're an expert overclocker EPP provides a jumping off point, if you're a novice it does all the hard work for you automatically. In additional to the settings the SPD provides to the computer, EPP memory contains up to two full performance profiles and up to four additional abbreviated profiles which allow the computer to switch between various settings on the fly. CAS Latency, RAS to CAS Delay, Command Rate and memory voltages are just some of the options that EPP can adjust on the fly. With automatic motherboard overclocking already a hit in the retail market, Enhanced Performance Profiles compatibility adds memory tuning to the performance mix. EPP will especially appeal more to the novice or moderate overclocker who doesn't want to muck around with memory timing adjustments much. Enthusiasts can still override the EPP profile by setting memory timings manually in the BIOS. At the moment EPP memory is only compatible with the nVIDIA nForce 590 SLI chipset, but VIA and Intel are expected to follow suit the idea is being proposed to JEDEC as an open standard. We expect all chipset manufacturers will adopt EPP memory support in the BIOS for high end products soon. If you are wondering whether the set of memory you're looking for is EPP compatible, just watch out for the 'nVIDIA SLI Ready' sticker. Since nVidia is first out of the gate with this standard, it's stickers will signify EPP compliant memory modules. If it has that sticker on the packaging then it's EPP compatible, if it doesn't then it's not.